Kwan Chin (Goh Yee) is outstanding as a batik master of Malaysia with a touch of Nanyang style. The general feature of Kwan Chin’s paintings is in depicting a bright atmosphere with excellent contrast of colours. He was briefly a commercial artist, but turned to oil painting and then to batik art, as a professional artist. He captures the wayang kulit ( puppet shows), the activities of the Malaysian wet markets, the shore line with the fishermen, the farmers with fruits, family lives and the like, reflecting truly a Malaysian artist who applied cubism and geometric forms in some of the figures. Kwan Chin gave a different dimension to art in applying broken lines on canvas to give an impression as batik art. His works had been exhibited locally and internationally and collected by Bank Negara Malaysia, Penang Batik Painting Museum and other institutions besides private collectors. Kwan Chin (Goh Yee) is outstanding as a batik master of Malaysia with a touch of Nanyang style. The general feature of Kwan Chin’s paintings is in depicting a bright atmosphere with excellent contrast of colours. 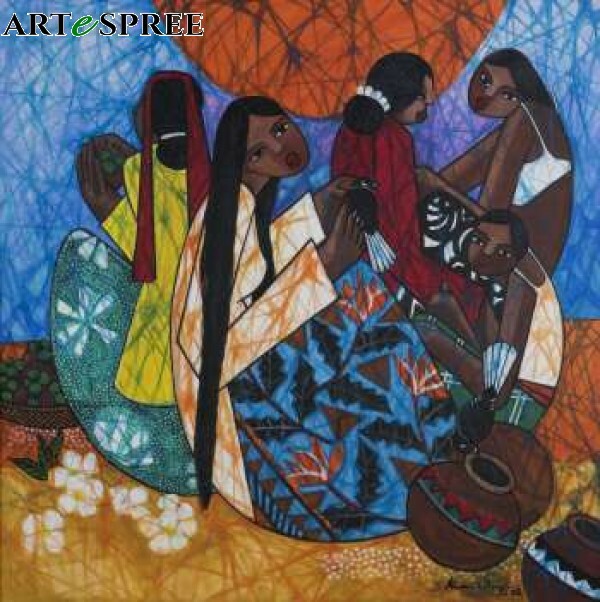 He was briefly a commercial artist, but turned to oil painting and then to batik art, as a professional artist. He captures the wayang kulit ( puppet shows), the activities of the Malaysian wet markets, the shore line with the fishermen, the farmers with fruits, family lives and the like, reflecting truly a Malaysian artist who applied cubism and geometric forms in some of the figures. Kwan Chin gave a different dimension to art in applying broken lines on canvas to give an impression as batik art. His works had been exhibited locally and internationally and collected by Bank Negara Malaysia, Penang Batik Painting Museum and other institutions besides private collectors.